Yup, another exciting novel from the author of The Brodsky Affair. Very timely too, since many are concerned about Monsanto and Genetically Modified Foods. I'm honored to reveal the cover of SUICIDE SEEDS, now available for Pre-Order on Amazon! Get a discount before its release on August 27, 2016. GET IT ON AMAZON for $0.99! What if there was a genetically modified seed that could stop the famine in West Africa? Local growers would clamor for the product. The government would welcome the company with open arms. Lloyd Olsen, a top executive in a major western GM seed company, NewCrop, is asked to move to West Africa and head the company’s operation. He is unaware of its criminal intent. West Africa is a staging post for a larger and highly suspect operation. The distribution of a non-seeding, nightmare crop… dubbed the Suicide Seed. But a seed that kills itself and all other natural seeds in its proximity… eventually devastating the continent’s agriculture, and wreaking havoc to its biodiversity. Farmers would have no choice but to buy their yearly supply from NewCrop. Either that, or starve and die. Chambers, NewCrop’s CEO, extensively bribes a top agricultural official, Bathurst, to cajole and menace local growers into accepting the company’s products. Bathurst is prepared to murder anyone who stands in his way, and he hires a psychotic killer to silence everyone who threatens the operation. A disabled senior agriculturist, Dr. Khan, discovers the conspiracy and tries to expose the real purpose of NewCrop. In doing so, he has placed himself in grave danger. Will he survive and save what’s left of West Africa’s crops? When Olsen learns about the true nature of the genetically modified seed, he has to choose sides. Will he risk his life and everything he loves to expose NewCrop? 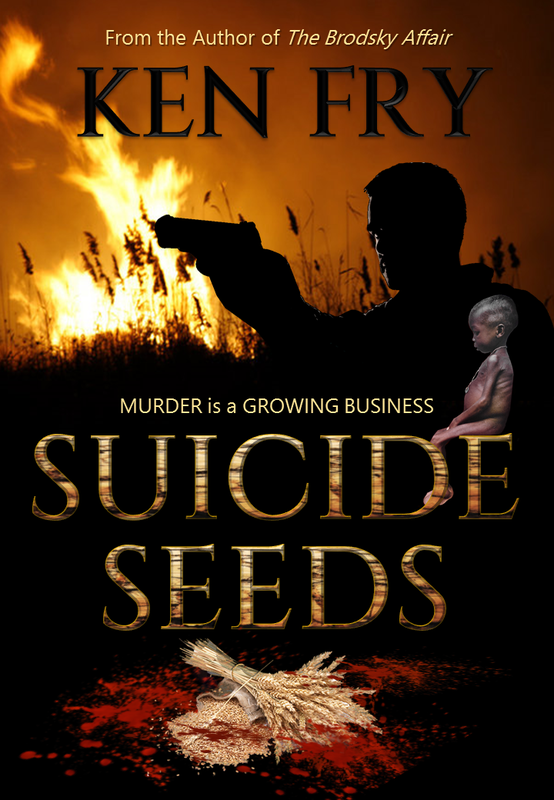 Ken Fry once again weaves a tale of murder and suspense that will keep you turning the pages. And now, here's the face of Suicide Seeds. Designed by Eeva Lancaster (me) for The Book Khaleesi. Join Ken Fry's Circle of Readers and get a free thriller.